This beautifully appointed and popular apartment is in the center of Sorrento village. Perfect for wedding guests, girls’ weekends and family getaways. Everything is at your doorstep. Leave the cars parked in the two carports and walk everywhere. Recently renovated, the spacious apartment has 180 degree views of the bay and is surrounded by beautiful limestone buildings. The very large private terrace allows sweeping views of Port Philip Bay, Arthurs Seat, Mt. Martha and Mt. Eliza. There is always something interesting to look at, from the big ocean liners and container ships passing by, to the Queenscliff ferry and the spectacular sailing and couta boat races. There is never a dull moment. Alfresco dining or lounging on the terrace is unsurpassed. The ‘front beach’ (as the locals call it) is the one you look at from your balcony. It is a 5 minute walk away. The bay waters are calmer, shallower and slightly warmer than the ocean waters of the ‘back beach’. It is great for wading, paddling, swimming, standup paddle boarding, windsurfing fishing and sailing. Take the kids for a paddle and watch them chase seagulls and admire shells. There are cafes and restaurants near the pier and in summer you can watch teenagers jump into the deeper waters. The old timber jetty is a lovely backdrop for a family photo and you may see a beach wedding if you’re lucky! Do try ‘The Baths’ on the beach for a coffee or a meal. The ‘back beach’, as the locals call it, is the wild ocean beach with waves for surfers, boogie boarders and swimmers. (Always swim between the flags for safety!) The ‘All Smiles’ cafe and restaurant and the National Park have picture perfect views of the stunning coastline and its gorgeous walking trails. The back beach is a pleasant 10 minute walk through town or only a few minutes drive away. Within a short drive are are numerous natural beauty spots and activities. The Peninsula Hot Springs, wineries, cheese makers, glass blowers, National Parks and many golf courses are all only a short drive away. There is a very good Information Centre in town only a short walk from the apartment. We highly recommend going there to plan your rest or activities! • LCD TV, DVD player and ChromeCast for connection to your preferred subscription such as Netflix. You must have your own subscription to connect. Strictly no parties, functions, weddings, pets or smoking. Minimum bookings of 2 nights, 3 nights over long weekends and 7 nights during January. The cleaning fee included fresh bed linen and bath towels for six people. If you have a smaller party please contact us for a reduced linen fee. Supermarket, Chemist, cinema and more. - Great pubs and a huge variety of restaurants and cafes. Don't miss the delicious Sorrento vanilla slices or the prize-winning fish and chips. We bought the apartment for our retirement in 1996. With Sorrento village at our doorstep and the spectacular bay views it is the perfect position. We are now both retired and live just down the road from the apartment where we can better accommodate our hugely extended family of children, grand children and overseas friends and family. Michael also needs a "men's shed" and a vegetable garden, to keep him occupied. Michael was an engineer and Cobien an interior designer. Position , position, position , stunning bay views and the huge private terrace . The apartment is right on the edge of town. It's less than one minute walk from the front door to shops and cafes. There are lovely historic sandstone houses in the surrounding streets. The apartment and large private terrace have 180 degree stunning views of the bay. The radiators are for heating only. The thermostat is on the wall between the kitchen and the bathroom. Please do not adjust the individual radiators. In an effort to keep your cost down, bed linen and towels are not included. They can be arranged at a small extra cost please advise us in advance. There is a full sized fridge plus a smaller fridge for the summer months. We tend to turn it off over winter to save power and be eco friendly. Aldi Espresso machine. We have provided a few pods to get you started. Please bring extra for extended stays or big coffee drinkers! We have provided some basic staples including tea & coffee and some condiments. Newly refurbished in 2017 the full kitchen has everything you should need for self catering. The apartment was great and the views were fantastic. Cobien the owner was very friendly and attentive to our needs. I would recommend this apartment to anyone as it had everything you require. Very impressed. Thank you for your kind words Anita and I am glad to hear that you enjoyed your stay. We look forwards to having you stay again. The location of this apartment is unbeatable! Easy access to shops and both front and back beaches. Despite our peak season visit the apartment was also very quiet and peaceful. The views out across the bay are delightful. Unlike previous reviews we found the decor very dated and the apartment not as clean as we would expect. We thought that for the price, the mattresses, pillows and bedding felt very old. And we were disappointed to find the 3 fans that were provided where too old and noisy to use and the umbrella left by the front door broken. It would be sensible to address little details such as these that can make a big difference to the experience. There was no attention to detail which was disappointing. Thank you for your feedback and I am happy to hear you enjoyed the location and tranquillity of the apartment. I note your comments regarding some details of the apartment and will take them into consideration. It is surprising that you didn’t find the apartment clean as the cleaning team attended before you arrived. Thank you for alerting me to the matter. If you could give more specific areas requiring attention it would be helpful. With regards to the bedding, I can assure you that it is not old and I have recently put new toppers on all the beds. Bed selection is challenging in a short term rentals as everyone has different ideas of comfort. Generally our guests are very happy with the beds. I am sorry you did not find them to your liking. I am a bit surprised you found the décor dated, as our numerous photos on the website are honest and accurate and show our contemporary eclectic style which most guests state is a reason they re-book time after time. Overall it sounds like you had a good stay and I hope to welcome you back again in the future. We recently spent 3 nights in this glorious apartment, spacious,modern, clean, very comfortable and warm, as it was a very unseasonable cold few days. It has a most spectacular view across to the bay, both from the patio and inside looking out. It is very centrally located and you can walk to the shops and beaches. We would definitely stay there again. Thank you Jane for your kind words. We are so pleased that you enjoyed your stay at our apartment. We look forwards to seeing you back again. Absolutely perfect apartment, amazing views and only a few steps from the shops or the beach. The apartment was absolutely perfect for our girls trip away. Plenty of space inside with everything we needed, lovely décor and artwork. The terrace was fabulous to sit out and enjoy 180* views of the bay. We had privacy and yet the Main Street shops were literally a few steps away with Sorrento's great cafes and trendy retail stores and a short walk to the beach. We had a wonderful weekend and will certainly be back! Thank you Julia. It was so nice to meet your enthusiastic friends and I am glad you all had such a fabulous time. Hopefully we meet in person next time but it was great to chat with you on the phone . THE MOST AMAZING APARTMENT IN SORRENTO!!! This Sorrento Appartment has to be our favorite location on all our travels to date. Very clean and extremely welcoming... a breathtaking view from the huge terrace where we would have every meal overlooking the stunning view. A beautiful kitchen and bathrooms with everything you’ll need for an entire family. Our children loved the appartment as well with the fast WiFi and Bluetooth sound system. Across the road from Sorrentos main shopping village with cafes, restaurants and supermarket. Everything you’ll need at your doorstep. A very quiet location for families who want to be away from the Party crowds. Thank You for your wonderful review Michael.. I am so glad you enjoyed our stay and we look forwards to having you and your family back again. We are so pleased that you enjoyed your stay at our apartment. We look forward to seeing you back again in the future. The apartment is conveniently situated right in the center of the picturesque historic town of Sorrento. The town can change from being bustling with holiday crowds to quiet and sleepy. There is something for everyone. There are many interesting walks and short drives. 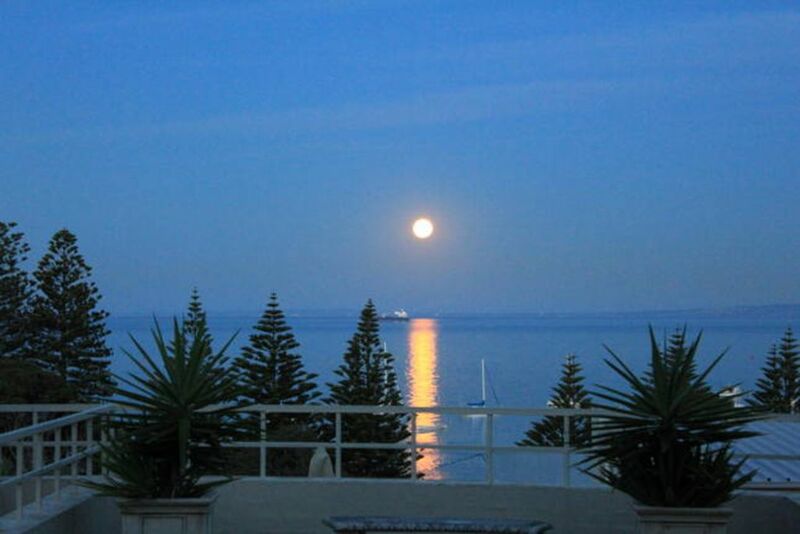 Enjoy fabulous sunsets and moonrises from the apartment. A photographers delight. Enjoy!